Q: How much does it cost to fully vaccinate a child? 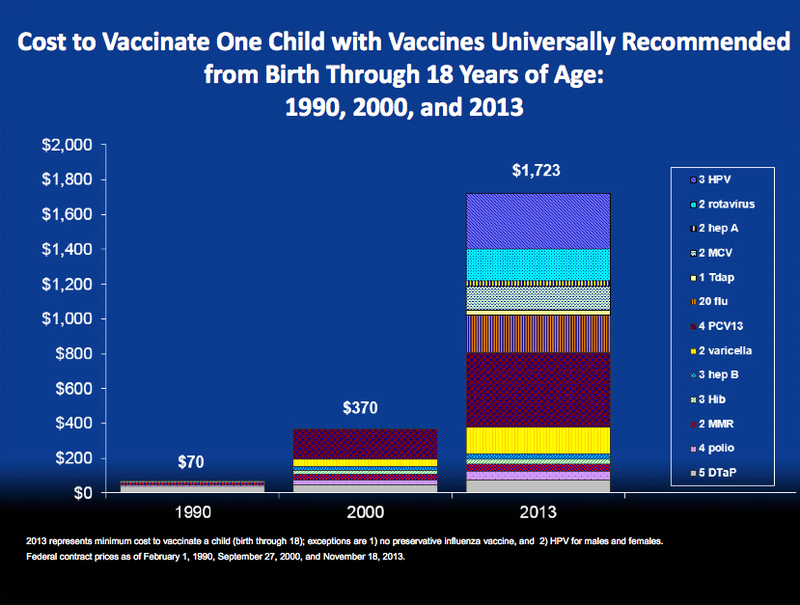 A: In 2013, the minimum cost of fully vaccinating a child in the U.S. was $1,723. This compares to $370 in 2000, and just $70 in 1990. The increase stems partly from increased costs associated with individual vaccines and mostly from the many new vaccines now being universally recommended. These are minimum costs because some states don’t require children to accept as many vaccines as others — for example, the HPV vaccine is not yet universally required — and also because some vaccines are more expensive than others. The thimerosal-preserved flu vaccine costs less than the flu vaccine that avoids thimerosal as a preservative. With hundreds of new vaccines in the pipelines, the cost to society of vaccines is likely to continue its steep climb. Pretty clear that money is a factor. Follow the money. Those are only the “before” costs. What is the point of tabulating the costs? It’s quite rare that parents must actually pay for their children’s vaccinations out of pocket. Medical insurances cover the costs in most cases. In most states, public health agencies procure the vaccines at discount in bulk and provide the vaccines to clinics at no cost. Regulations state the clinics cannot charge for the vaccine and vaccines are almost universally available free via state and county public health agencies if children do not have a regular health care provider. And – many state regulations also prohibit what can be charged for adult vaccine administrations. Compared to many other medications and especially the new meds still under patent, the cost of vaccines is dirt cheap. There is no such thing as a free vaccine. We pay for our vaccines through our insurance and through our taxes. Without understanding costs, it’s impossible to make informed decisions. Do you think there’s no point in tabulating the costs of defense, or of education spending, or of interest on the debt?